Manny Pacquiao told anyone who would listen he was on a mission. A mission to prove he’s still a force to reckoned with, even at age 40. 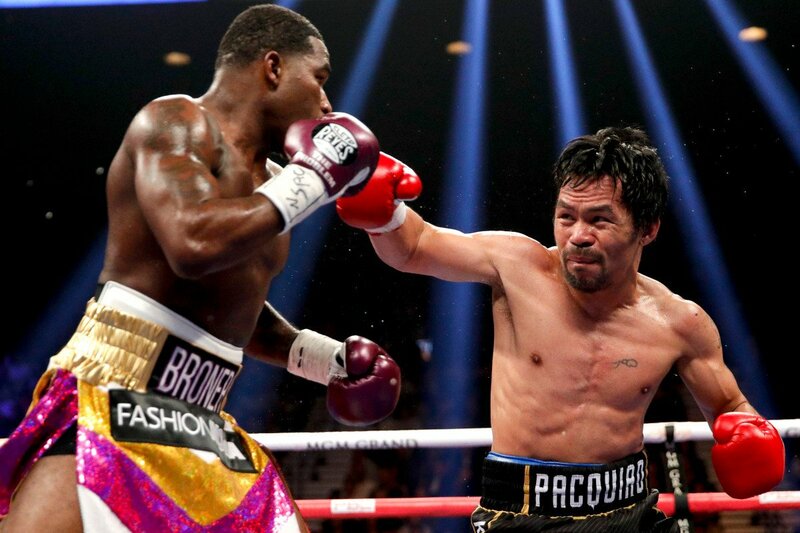 Pacquiao did just that with a dominant performance in his first U.S. fight in over two years. He hurt Adrien Broner badly several times, though he scored no knockdowns, and controlled the action from the onset. He’s not the wrecking ball of old, but this version of Manny Pacquiao is still pretty damn good. The bout was Pacquiao’s debut under the PBC banner, and with so many talented welterweights advised by Al Haymon, there’s a wealth of high-profile matchups at the Filipino senator’s disposal. There’s no bigger fight, of course, than a rematch with Floyd Mayweather, who sat ringside and watched Pacquiao beat Broner pillar to post. “Tell him to come back to the ring and we will fight,” said Pacquiao, who was outpointed by Mayweather during their record-breaking fight in May 2015. “I’m willing to fight again Floyd Mayweather if he’s willing to come back to boxing. What happens next for Broner (33-4-1, 24 KOs) is a different matter. He never could get over the hump in high-profile fights. The former four-division titleholder has now lost to the likes of Pacquiao, Marcos Maidana, Shawn Porter and Mikey Garcia. Broner’s best career-victory remains a controversial decision over Paulie Malignaggi in a 147-pound title fight. To the astonishment of those at ringside, Broner jumped up on the ring post and beat his chest after the final bell in a bout he failed to compete in. Broner connected on just 50 punches total, per CompuBox. He didn’t land more than seven punches in any given round. And in a fight he was clearly losing, Broner elected to survive rather than press the action. What else is new? The 29-year-old landed only one punch in the final frame. Pacquiao, the only eight-division champion in boxing history, is a surefire first-ballot hall of famer. He’s one of the best fighters of all time, and even at age 40, he’s still adding to his legacy. This was Pacquiao’s 15th fight at MGM Grand, and now 13,025 fans packed the venue to watch one of the all-time greats. He was saddled with a large tax lien that forced him to compete overseas for his last two outings. His knockout of Lucas Matthysse in July was staged in Kuala Lumpur, Malaysia; it was his first finish inside the distance since November 2009, when he stopped Miguel Cotto in the final round of what’s widely considered the greatest performance of his legendary career. Now we wait to find out to if Mayweather and Pacquiao will fight again in a rematch of their superfight that shattered revenue records. Mayweather would first need to come out of retirement for the umpteenth time, and while an encore encounter surely wouldn’t match the first bout in terms of business generated, it’s still the most high-profile fight that can be consummated in the sport. If another fight with Mayweather doesn’t materialize, Pacquiao could head to a fight against the winner of the March 16 welterweight title tilt between Errol Spence Jr. and Mikey Garcia. Pacman told The Ring earlier this month that he’s interested in such a matchup, and sources confirmed that PBC officials are keen to put it together. Pacquiao told The Ring he plans to fight one more time in 2019, a bout in either May or July. His Senate duties in the Philippines, he said, will preclude him from fighting at other junctures in the year. But when he’s ready to return, we’ll be watching. Even at 40, this version of Pacquiao appears good enough to hang with the best.